This is the best luxury car for you if you relish the idea of living in the biggest house in a neighborhood of medium-sized homes. South Korean automaker Hyundai created the Genesis brand for model-year 2017 to separate its upscale vehicles from its mainstream offerings. It’s a blueprint Toyota followed when it created Lexus, Honda when it spun off Acura, and Nissan when it spawned Infiniti. 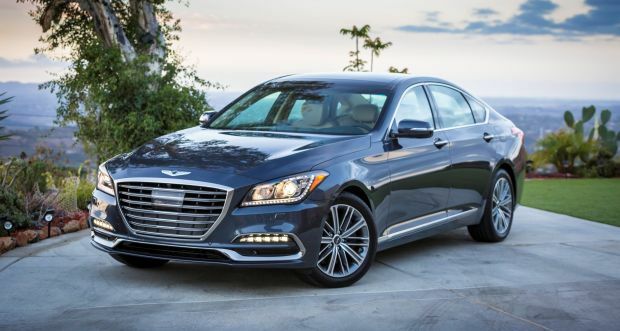 Genesis debuted with two four-door sedans, the midsize G80 and the full-size G90. The compact G70 sedan is coming for model-year 2019, and a crossover SUV, the GV80, is due in calendar 2019, likely as a 2020 model. Genesis is a new brand, but the G80 and G90 are based on cars originally sold as flagship models within the Hyundai lineup. The G80 was the Genesis Sedan and the G90 was the Equus. Genesis marketers position the G80 against the costlier Audi A6, BMW 5 Series, Cadillac CTS, Infiniti Q70, Jaguar XF, Lexus GS, and Mercedes-Benz E-Class. However, given its price and pedigree, we place the G80 in a slightly less well-defined competitive set of upscale intenders such as the Chrysler 300, Toyota Avalon, and the Stinger from Hyundai’s corporate partner, Kia, as well as entry-level sedans from premium brands, such as the Acura TLX, Infiniti Q50, Lexus ES, and Lincoln MKZ. Despite a massive investment in engineering, marketing, and other resources, Hyundai has stumbled in getting its luxury marque off the ground. Initially, it said Genesis-brand vehicles could be sold only by top-performing Hyundai dealers and would share the showroom with mainstream Hyundai models. Then it mandated that the Genesis brand would be sold only in standalone facilities. Interested Hyundai dealers could make the investment in a new facility or take a cash buyout and forfeit their right to sell Genesis models. As of early summer 2018, Genesis cars were being sold at most Hyundai dealerships until standalone facilities were completed. Amid the transition, G80 sales were down 22 percent through April 2018. It was being easily outsold by all the aforementioned cars we placed in its competitive set, although it was outselling the Q70, XF, and GS. Buy a 2018. 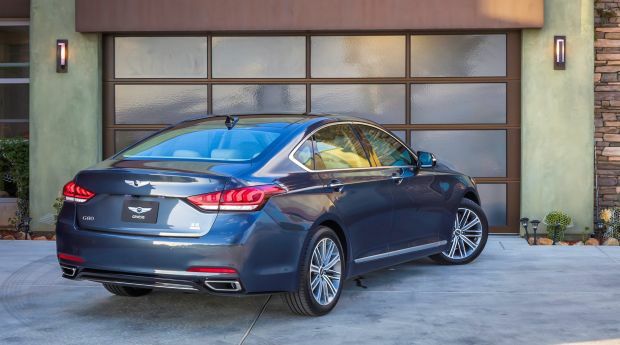 It marks the midcycle refresh of this second-generation Genesis sedan, which debuted as a Hyundai for the 2015 model year. With the Genesis brand focused on launching the G70 and GV80, expect the G80 to be virtually unchanged for model-year 2019, although it’ll almost certain be priced higher. Big news for the ‘18 G80 is addition of the 3.3T Sport model, a performance grade with an engine, suspension, and styling cues unique in the G80 lineup. It slots between the returning entry-level 3.8 model and the flagship 5.0 grade, both of which receive minor underhood updates designed to improve engine responsiveness and fuel economy. Other model-year ’18 changes include additional sound insulation and enhanced driver-assistance features. Rear-wheel drive is standard on every ’18 Genesis and all-wheel drive is optional. Styling: The 2018 refresh gives the returning G80 3.8 and 5.0 models new standard wheels, upgraded headlights, and restyled front and rear fasciae. Their overall look is reminiscent of the Audi A6, no surprise given this car’s lead stylist spent a good portion of his career with the German automaker. Most appealing is the new 3.3T Sport, with its more aggressive front fascia, wire mesh grille, and blackout wheels. 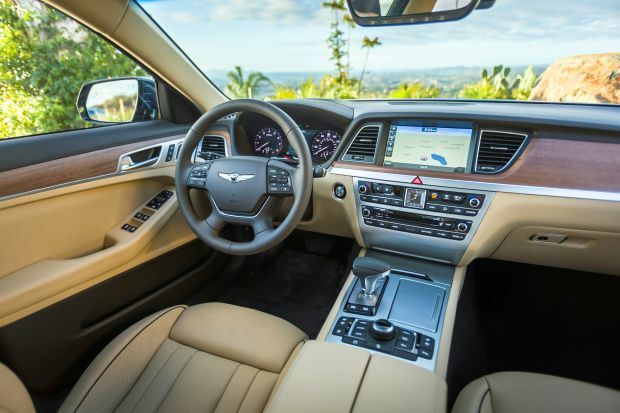 With impressive fit and finish and features like LED headlamps, leather upholstery, and a comprehensive set of safety kit standard, the G80 is appropriately premium and gets the Genesis brand off on the right foot. Still, this car is attempting to take on rivals from established luxury marques that have distinct identities. We think it’ll be another design generation or two before Genesis can truly claim it’s on even footing with them. We would also describe the interior as sufficiently premium. Headroom and legroom are among the best of any premium midsize sedan. Additional sound deadening material for 2018 means the G80 is exceptionally quiet, too. Materials quality is generally excellent, with available authentic Paldao and Sapele wood finishes lending an extra dose of class. The leather upholstery is lounge-chair plush but not so soft you feel you’re sinking into the seats. The 3.3T Sport cabin stands out for its metal and carbon-fiber trim pieces and unique three-spoke steering wheel. Trunk volume of 15.3 cubic feet is slightly above the premium-midsize-car average, but cargo versatility is compromised by rear seatbacks that don’t fold (there a center pass-through). Interior storage is quite good, with a generously sized glovebox and door pockets. For 2018, engineers added second USB power point to the center console, but there are no ports for rear-seat occupants. The G80’s upscale aspirations are letdown by an instrument cluster, window switches, gearshift lever, infotainment interface, and audio and climate controls that look and feel like they were taken out of Hyundai’s Elantra compact car. That surely saves cost, but won’t appeal to the BMW, Lexus, Audi, and Mercedes intenders Genesis hopes to lure. On the upside, Apple CarPlay, Google Android Auto, and an imbedded navigation system are standard. The 8-inch infotainment touchscreen included on the 3.8 model is adequate but the 9.2-inch display optional on the 3.8 and standard otherwise has crisper graphics. One G80 we tested, however, responded very slowly to inputs when using the imbedded navigation and CarPlay functions. Mechanical: Model designations are based on engine types. The 3.8 has a 3.8-liter V-6 with 311 horsepower and 293 pound-feet of torque and does 0-60 mph in about 6.5 seconds, on par with rivals of similar power. The 3.3T Sport employs a twin-turbocharged 3.3-liter V-6 of 365 horsepower and 376 pound-feet of torque. We have not yet evaluated this model but expect it to be at least a second quicker to 60 than the 3.8. The range-topping 5.0 has a 5.0-liter V-8 with 420 horsepower and 383 pound-feet of torque. This robust V-8 has ample muscle for any situation. All 2018 G80s have a well-sorted 8-speed automatic transmission that delivers immediate response to throttle inputs. Credit Hyundai with understanding a premium brand is best served by the handling balance and prestige of rear-wheel-drive-based engineering. 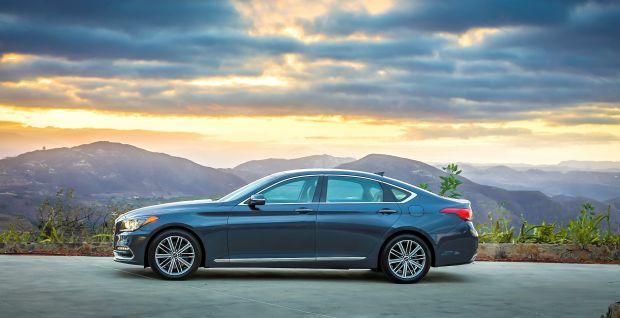 All its Genesis vehicles have been rear-drive-based and the current line is available with all-wheel drive, a vital premium-brand sales feature in America’s snow-belt markets. On the road, the G80 attempts to blend the athleticism of an A6 or 5 Series and the cushioned comfort of an E-Class or MKZ. For the most part, it succeeds. Hyundai has over recent years refined the steering and suspension setup of all its vehicle. Indeed, most of the slop and annoying secondary motions that plagued the ride and handling of previous Genesis models have been eliminated. Still, the G80 3.8 and 5.0 don’t quite achieve the level of buttoned-down sophistication you’ll find in more established luxury competitors. Features: Happily, Hyundai’s corporate policy of packing vehicles with lots of creature comforts for the money carries over to the Genesis brand. Even the G80 3.8 comes very well equipped out of the box. Among its standard amenities are bi-xenon headlights, LED daytime running lights, power-folding auto-dimming exterior mirrors, leather upholstery, heated 12-way power adjustable front seats, heated steering wheel, driver seat memory, power tilt and telescopic steering column, dual-zone automatic climate control, imbedded navigation, and three years of Genesis Connected Services telematics. All models also include a comprehensive suite of driver-assistance features, including blind-spot alert with rear cross-traffic detection, lane-departure warning with automatic steering correction, automatic high-beam headlight control, and full-speed radar cruise control that can maintain a fixed distance from traffic ahead. New for 2018 is drowsy-driver alert. Further, the standard autonomous emergency braking system has been upgraded to include pedestrian detection. The 3.3T Sport gets unique exterior trim, a sport suspension, quad exhaust outlets, full LED headlights, alloy sport pedals, microfiber suede headliner, sport bucket seats with contrast stitching, extendable thigh support for the driver’s seat, full-color head-up instrument display, panoramic sunroof, surround-view camera, power trunk lid, wireless cell-phone charging pad, high-definition 9.2-inch touchscreen infotainment, 17-speaker Lexicon-brand audio system, front- and rear-obstacle detection, ventilated front seats, power rear window sunshade, and heated rear seats, which are also standard on the AWD 3.8. The 5.0 model’s feature set is similar to that of the 3.3T Sport while adding the potent V-8 engine, specific interior trim, and manual rear side window sunshades. All Genesis cars benefit from Hyundai’s warranty of 5 years/60,000 miles bumper-to-bumper and 10 years/100,000 miles powertrain. Also included is 3 years/36,000 miles of complimentary scheduled maintenance. Valet service is available provided you live within a certain radius of the dealership. Roadside assistance coverage is for three years with no mileage restriction. That’s a step down from Hyundai, which offers the same service for five years and unlimited miles. With rear-wheel drive, the 3.8 starts at $42,745. Its $5,000 Premium Package adds LED foglights, a panoramic sunroof, a 14-speaker Lexicon audio system, wireless smartphone charger, obstacle detection, ventilated front seats, and rear sunshades. The $10,100 Ultimate Package includes the Premium Package plus nearly all the content that’s standard on the 3.3T Sport and 5.0 grades. The 3.3T and 5.0 have no factory options. With rear drive, these models are priced from $56,245 and $57,995, respectively. All-wheel drive adds $2,500 across the board and is a feature we strongly recommend if you live in wet and/or snowy climates. A 3.8L with either rear or AWD and no options is our pick for best value. If you can stretch your budget, we also like the more aggressive looks of the 3.3T Sport. With no turbocharged four-cylinder engine available, G80’s EPA fuel-economy ratings track below the class average. Rear-drive versions rate 19/27/22 mpg city/highway/combined with the 3.8-liter V-6, 17/25/20 with the turbo V-6, and 16/24/19 with the V-8. All-wheel drive drops ratings to 18/25/20, 17/24/20, and 15/23/18 mpg, respectively. Our test AWD 3.8 averaged 21.2 mpg in our suburban test loop. Genesis recommends premium-grade 91-octane gasoline for the turbo V-6 and the 5.0-liter. The 3.8 uses regular-grade 87-octane. The other engines can use regular as well with a slight decrease in horsepower and torque. Probably not a whole lot for the next few model years. Hyundai is readying a turbodiesel four-cylinder engine for use in the G80, but availability will almost certainly be exclusive to Europe and South Korea. Expect the North American car to stand pat until the next-generation model debuts, likely for model-year 2021.